5.1.3 Not getting the expected data? 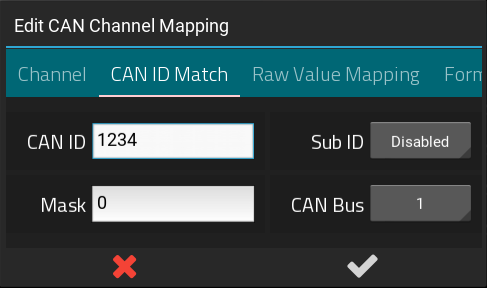 Mapping an existing CAN bus system can be easy with basic knowledge of CAN mapping, and most importantly - if CAN technical documentation is available for the device in question. Fortunately, ECU and sensor manufacturers are keen on providing documentation as they naturally want their devices as inter-operable as possible. If documentation isn't available, the problem is just more interesting to someone with the time and skills, and it helps that the CAN bus system is open in terms of it's messaging format and provides simple 8 byte message packets with a numeric identifier, much like an internet IP address. To successfully perform a custom CAN integration, it's helpful to have the following knowledge before you get started. Basic knowledge of CAN bus technology. Here are some some helpful links. If this appears challenging, get a friend to help and / or jump onto the forums and ask for assistance - another forum member might have mapped the same system as you're working with, or can help you with your particular project. Fortunately, we have a growing library of pre-set configurations for different ECUs and sensors. As time goes on, the chances grow that you'll be able to simply click a button and have a quickly working CAN integration. This port is typically used for the optional CAN-OBDII interface cable, but can also be used for custom integrations. Both CAN channels are available on the RJ45 connection. You can custom crimp an RJ45 cable, or you can use a standard CAT-5 ethernet cable with RJ45 connectors to integrate with RaceCapture/Pro. Important note for MK2: The +12v connection on the RJ45 is connected internally to the +12v on the terminal block on RaceCapture/Pro MK2. It's recommended you only power via one source - RJ45 or terminal block - if you have both connected at the same time, you may cause back-feeding of power through RaceCapture/Pro, which may cause damage to the unit. Note: RaceCapture/Pro MK3 has internal protection diodes which avoids this issue. If you are working to integrate an ECU, first ask the manufacturer for their CAN bus specification. This documentation will provide a breakdown of channels - such as RPM, temperatures and pressures and describe how they appear in the CAN message stream. A good example is the Megasquirt CAN Broadcast Specification. CAN Identifier: The CAN Identifier for each channel. This may appear in either 11 or the extended 29 bit format. Typically 11 bits are used. Offset: where the data starts within the 8 byte CAN message. An offset of 0 means the data starts on the first byte. Scaling: The raw value from the message is often scaled to a real world value. Typically this is provided as a multiplier and adder value, but may also specify a divider. Additionally, the manufacturer will specify if multi-byte (16, 24 or 32 bit) values are presented in Big Endian (MSB (Most Significant Bit)) or Little Endian (LSB (Least Significant Bit)) mode. BigEndian mode data will have the high byte presented first in the data packet and is typically the most common format. Once you have the CAN connections wired, you can enable CAN bus on your RaceCapture system. This provides the ability to turn on the CAN bus connectivity at the global level, and allows you to set the baud rate for the individual CAN bus channels. After making changes, be sure to write your configuration back to your RaceCapture device. The direct CAN mapping capabilities will allow easy mapping of 99% of existing CAN based ECUs and sensors. For the outliers, you can map CAN data using the on-board Lua Scripting, allowing for any custom formula or logic. To start, connect to your RaceCapture device and ensure the current configuration is read, or open a previously saved configuration. Navigate to the CAN Mapping page. Press the (+) button to add your first channel. The first tab will let you define the channel name and sample rate. 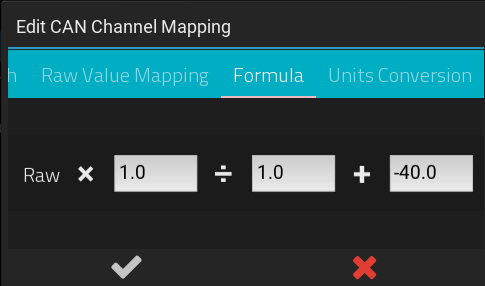 Channel Name: selecting a channel name from the drop-down will pre-set the units, min and max to typical values. You can customize this by pressing the gear icon. Rate: This sets the rate that RaceCapture will log or broadcast the data for this channel. This rate is independent of the actual rate the CAN data is received. The CAN ID match tab lets you define the CAN ID to match upon, and the CAN bus the data is expected to appear upon. 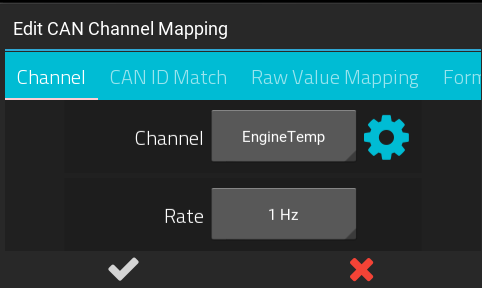 The manufacturer will specify the CAN ID for the channel you are mapping. CAN ID: this is the ID of the CAN bus message, in decimal format. Mask: This is an optional mask, in decimal format. If set to greater than zero, the Mask will be logically AND'd with the CAN ID for further matching and filtering. 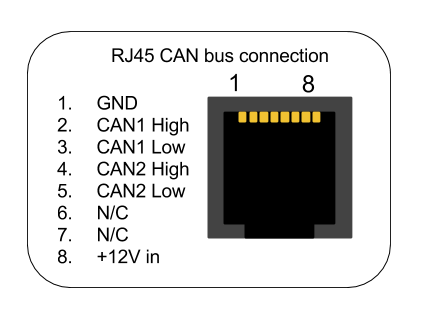 CAN Bus: Select the CAN bus your data is appearing on - CAN 1 or 2, depending on the available CAN ports of your RaceCapture device. The Raw Value Mapping tab lets you define how to extract the data from the 8 byte CAN message. The manufacturer's CAN documentation will identify this information for channel you are mapping. Offset: this is the offset where the data appears in the CAN message. An offset of 0 would be used to start at the first byte of the CAN message. Length: this represents the length of the value. A length of 1 would be one byte, 2 would represent a two byte or 16 bit word, and so on. Unsigned: the data is provided as an unsigned value. Signed: the data is provided as a two's compliment signed value. Sign-Magnitude: the data is provided as a sign-magnitude encoded value. Endian: This defines Big Endian (Most significant bit / MSB) or Little Endian (Least Significant Bit / LSB) mode, and applies to values where the data length is 2 or higher. The manufacturer's documentation will identify whether the data is encoded in big or little endian format. Bit Mode: This allows mapping in cases where the data does not fall on even byte boundaries. For example, you may want to extract a single bit at the offset of 11; in which case you would enable bit mode, then set your offset to 11 with a length of 1. The Formula tab lets you define how to convert the extracted raw value into a meaningful real-world value. Use these fields to specify the conversion formula you wish to apply to the raw value extracted from the CAN message. The manufacturer's documentation will specify the conversion formula. 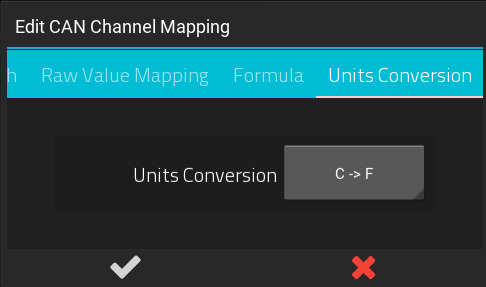 You can optionally apply a common units conversion to the value after it has been processed by the formula. Often the manufacturer will provide the mapping in one form of units - this allows you to retain the original mapping and then convert the units to the desired format. When complete with the mapping, press the (check) button and then Write your configuration back to RaceCapture. You can then go to the dashboard to monitor the current channels and verify you are receiving data as expected. Not getting the expected data? See the Troubleshooting Guide to help understand and identify problems in your CAN mapping and connectivity. For custom mapping that cannot be handled by the direct CAN mapping capabilities, you can map data using the on-board Lua scripting runtime. 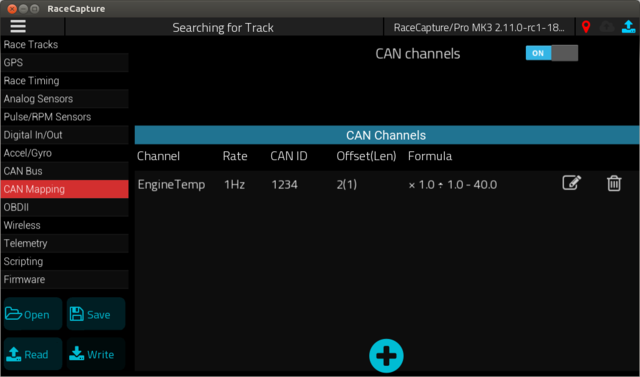 Here you will be able to apply any formula or custom logic to the data before mapping it to a channel in RaceCapture. You can use the Lua scripting to read and process data from a CAN message. See the Lua Scripting reference for a list of CAN bus functions. Set up the channel. Example "EngineTemp"
Example: Set MyChannel from CAN ID 1234. Data is in the first byte of the message. Below is a script framework to ease mapping of CAN bus data to virtual channels. You can copy the script and modify as you need. This example showcases mapping some of the BMW E46 CAN bus channels. To create your own integration, edit the top portion of the file to match your system's CAN bus configuration and data mapping. Reverse engineering can be a rewarding experience, providing you can log the CAN data stream from the device and compare it against direct measurements on the system. Directly measure or observe a sensor channel and compare it against changes in the CAN bus data, watching for patterns. An example for decoding RPM: To detect which CAN message contains RPM, log all CAN messages while simultaneously directly logging RPM, synchronizing the messages and the direct RPM measurement in time. Watch for patterns in the CAN data: any data changing in sync with the direct RPM measurements will be a strong indicator of which CAN message contains RPM data. Repeat with other sensors of interest, such as steering angle, tempertures, etc. You can use a commercial CAN data logger, or simply use RaceCapture/Pro's CAN bus logger script to output all messages to the logging window. Ensure the baud rate matches the network you're connecting to. Ensure the CAN termination is correct for the network you are on. Termination is required at both ends of the network; check your manufacturer if termination is enabled inside the device, or if an external jumper is needed. RaceCapture/Pro MK3, RaceCapture/Apex, PodiumConnect: Termination is software controlled; enabled by default. It can be enabled/disabled in the CAN Bus settings page. RaceCapture/Track (MK1, MK2) - Termination is disabled by default. Termination can be enabled by enabling an internal jumper. The CAN activity LED will indicate if CAN data is being received by your RaceCapture system. If it's illuminated, that means RaceCapture is receiving CAN data. If you're using a preset, check if the CAN bus you wired matches the CAN bus selected for each channel in the preset. Most presets are configured to use CAN1. 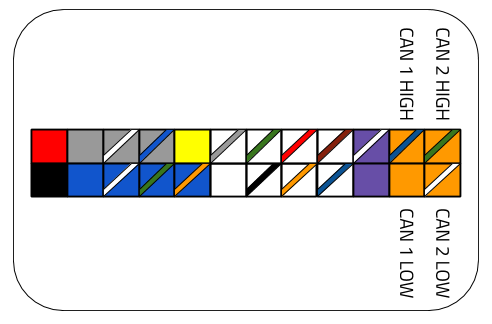 If you wired your CAN but to CAN2, you will need to switch each channel under presets to CAN2. 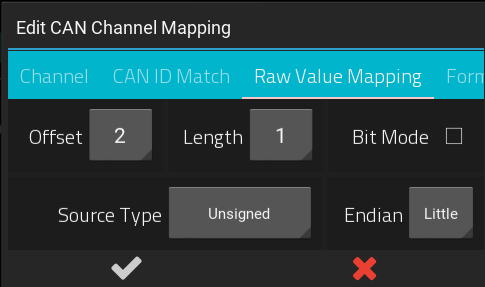 CAN IDs match the IDs you have defined under the CAN channels. Some devices have the ability to set an alternate addressing scheme; their documentation will indicate if this is possible. Use the simple logging script to display all CAN traffic in the logging window to see if what you are receiving is what you expect. Try using the simple logging script to show any incoming data and that it matches what you expect vs the manufacturer's specifications.